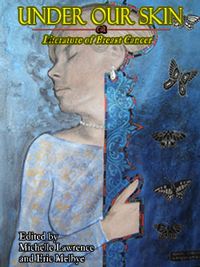 Michelle Lawrence is the co-editor of Under Our Skin: Literature of Breast Cancer (2006). The book is an anthology of fiction, poetry, creative nonfiction, and photography, all of which explore the multifaceted experience of breast cancer. Essays from price winning authors - among them Kelli Russell Agodon, Gretchen Fletcher, and Octavia McBride-Ahebee - are inspirational and also serve as guide on a journey of anger, sadness, humor, friendship, and hope.